I know you probably hear this a lot, but I’m seriously your biggest fan! I’ve wanted to meet you for over a decade, and now that it’s finally happened, I’m totally FREAKING OUT! You know that one day when you said how much you loved my book? Oh . . . my . . . gosh. My heart was beating a million times a minute. I keep wondering if you’re all secretly related to me, or if maybe my mother has made a hundred or so sock-puppet Goodreads accounts just so she can encourage me to keep writing. But then you tell me you’re from the Philippines, or Texas, or Canada, or London, or Slovenia, or that gorgeous African island of Mauritius, and I just can’t wrap my head around it! And never in a million years did I think that even one of the 1.2 billion people in India would even know I existed, let alone be excited to read a novel I wrote! Like . . . what?! But then I decided to be a writer. And I hoped people would actually like what I wrote, enough to even pay money for it. But I soon learned that this dream was, as some teenagers today might have told me, totes cray cray. I had no clue whatsoever how much work would be involved, or how many times I would get my heart broken, or feel like a complete and utter idiot for even thinking I could become a published author. But you, super-awesome readers, have changed everything. You’ve made me believe that all of the hard work and heartache was not only worth it, but have given me so much HAPPINESS that I’m jumping up and down with jazz hands in the air, wanting to do it all over again! So sign me up for even more writer’s block, and self-doubt, and pulling my hair out! Go ahead and toss in some of that heartache and rejection! That’s right! This time I’m well prepared for the crazy/awful/awesome pathway to publication, because I now know who’s waiting for me at the end of it. Gabrielle from New Hampshire. The first reader I know of to spy it & buy it in the wild! Amy Finnegan writes her own stories because she enjoys falling in love over and over again, and thinks everyone deserves a happy ending. She likes to travel the world—usually to locations where her favorite books take place—and owes her unquenchable thirst for reading to Jane Austen and J.K. Rowling. Her debut novel, NOT IN THE SCRIPT, came about after hearing several years of behind-the-scenes stories from her industry veteran brother. She’s also been lucky enough to visit dozens of film sets and sit in on major productions such as Parks and Recreation and Parenthood. 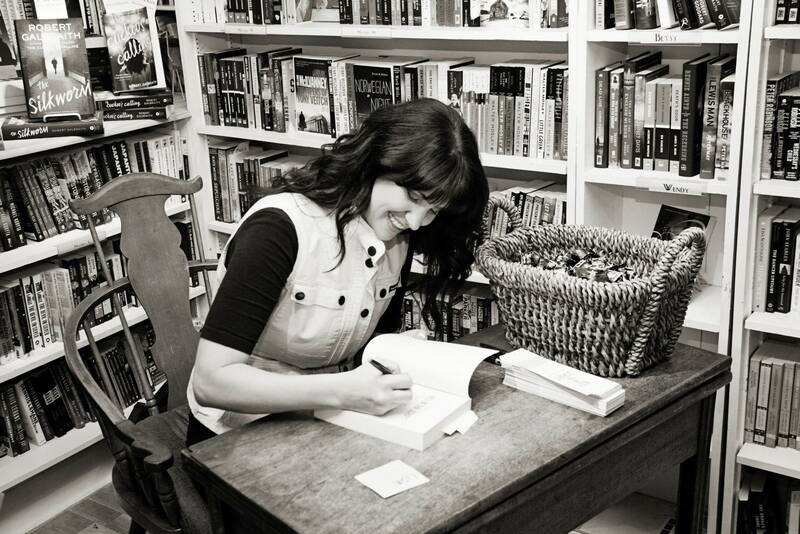 You can follow Amy on Twitter @ajfinnegan, Instagram: StrangerThanFictionWriter, or Facebook (Amy Finnegan, Author). I know that they already made a movie out of Gail Carson Levine’s Ella Enchanted, but I think it could have been SO much better! Although I loved the choice of Anne Hathaway for Ella, they took too many liberties with subplots that weren’t in the book, like Mandy’s boyfriend, Benny (who was turned into a talking book? ), the whole character of Char’s cruel Uncle Edgar, and a whole lot of silliness with the battle at the ending. The book was so strong on its own, I thought, that all the additions of the movie just whittled it down to a shadow of what it cou ld have been. Rick Riordan’s Lightning Thief was a great book. 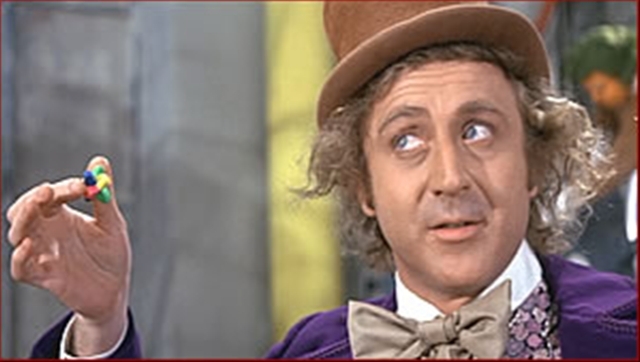 Full of voice, humor, imagination. And it’s kid-centric. What does Hollywood do? They start with Zeus and Poseidon chatting. Wrong. So wrong. Apollo and all of the Muses should have smote a whole studio for that travesty. A book that needs to be turned into a movie or TV show? Our very own Joshua McCune’s TALKER 25! I mean, it’s got a page-turning plot. It’s got awesome characters, both human and dragon, ready for actors and CGI artists to take them on. And it’s even got its own T V-show-within-a-show–Kissing Dragons–built in. I know I’m not the only reader who feels this way. Hollywood, please take note! Most recently, Joshua McCune’s TALKER 25 struck me as a book that needs to be made into a movie. I think the visuals would be stunning, and it’s a powerful, impactful story. Of course, I might have to close my eyes during a few of the scenes. You know the ones. WOW. Before that, the book that I closed and immediately gushed, “This HAS to be a movie!” is Jeanne Ryan’s NERVE. Lucky for us, a movie is in the works (there’s some news here). Squee! Lastly, I would love to see Laini Taylor’s early novels, the Dreamdark series, made into movies. Laini created such a lush, detailed world and filled it with a cast of unique, fascinating characters on an epic quest of good versus evil. BLACKBRINGER and SILKSINGER are still on my favorite-books-of-all-time list. I can never get enough of them! I recently finished GREENGLASS HOUSE by Kate Milford and I think it would make a wonderful, wonderful movie. The story is very Clue-esque, for any other fans of that movie out there, and revolves around 5 mysterious people showing up at an inn on a snowy winter night and the mysteries that get unraveled from there. I can imagine fabulous potential for the cinematography between the snowy cliffside setting and the mysterious mood of the story. The Prydain Chronicles by Lloyd Alexander would make a fantastic movie series, if someone had the money and the vision to do it right. The books had humor, adventure, tragedy, and romance. I wish the sad Disney version of The Black Cauldron had never happened! Taran’s journey from Assistant Pig-Keeper to (spoiler alert) High King was epic, and his romance with Eilonwy is one of my favorites in all of literature, children’s or otherwise. Two of my favorite book-to-screen ventures are Jane Austen adaptations. I love Emma Thompson’s and Ang Lee’s Sense and Sensibility – a story that may actually shine brighter in their retelling than it does in the book (don’t hurt me, Austen people! I’m one of you). I wish only for one thing: that they’d kept the scene where Willoughby returns and tries to explain his behavior to Elinor. But even without that, this film is a masterpiece. I also have a massive crush on Colin Firth as Mr. Darcy amount of respect for the BBC’s 1995 TV miniseries of Austen’s Pride and Prejudice. It’s faithful, well acted, and completely worth the 5+ hours it takes to watch. It’s also worth investing in the new blu-ray release, because the costumes and sets are detailed and spectacular, but their beauty can only be fully appreciated in blu-ray. However, near perfect as this miniseries is, I’d still rather read my battered copy of the book. When I think about a book that should be made into a movie, I would pick a book that has stayed with me in some way. So I would choose Unwind by Neal Shusterman. The reason this book has stayed with me is because the whole idea a being unwound creeps me out. It haunts me. It’s one of those things that you think would never come to be…but what if it did? Shivers! And I love movies that give me the shivers! I searched the Internet and it seems Unwind will be made into a movie but details are sketchy. When it is a movie…I’ll be there. Creeped out, haunted, and with a major case of the shivers! One of my favorite books in the universe is Kathi Appelt’s The Underneath. I think it would make a fantastic and fantastical movie and I think, specifically, Hayao Miyazaki should come out of retirement to make it! Can’t you just see it? Ranger, Puck, Grandmother Moccasin and Miyazaki together? The landscape begs for Miyazaki’s magical perspective and the story is just up his alley. It would be gorgeous and riveting. C’mon, just one more movie, Miyazaki, please?! 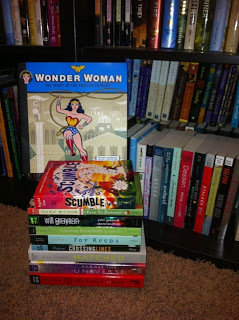 Remember, comment on any post this week to win a fantastic book+swag package put together by Amy Finnegan! Amy Finnegan’s debut novel, NOT IN THE SCRIPT, takes readers behind the scenes of the fictional TV series, Coyote Hills. It got us thinking about the television shows we’ve loved over the years, the ones that kept us coming back week after week. When we asked the EMUs to weigh in with their absolute favorite TV shows of all time, it was all very civilized–no punches were thrown, no cross words exchanged. Although the final picks vary widely across several decades and multiple genres, we hope you’ll agree that our list makes for some dang fine television viewing. I watched a lot of TV in the 80s. I mean, like, a lot. To this day, any time I stumble upon an episode of The Love Boat, Charlie’s Angels, CHiPs, or The Dukes of Hazzard, I will sit down and watch. I can’t help it. My gleeful nostalgia meter spikes up into the stratosphere. But my very favorite show of all time was Simon and Simon. Two cute brothers, solving crimes, cracking jokes and watching each other’s backs? I was hooked! Ever since, my taste in TV has followed a similar pattern. Case in point: Psych is probably my second very favorite show, because: Humor! Action! Buddies getting into trouble! I could cite many other examples, but since we were supposed to pick just our favorites, I will merely say that I am predictable but consistent. Favorite TV Show of all time?!? I never missed an episode of Gilligan’s Island when I was a kid. Never. I think I played island castaway for years in my backyard. My best friend and I would switch off being MaryAnne or Ginger. But really, I think we both wanted to be the goofy, goodhearted Gilligan. I don’t think it had any influence on my writing except maybe, well, the show did play around with multiple perspectives. So my favorite TV show as a twenty-something was, hands-down, ThirtySomething. I was obsessed. Maybe because I felt like it was showing me what my own life could be like in ten years. Maybe because it was showing me what I WANTED my life to be like in ten years. I loved following the multiple storylines, I loved thinking about what I might do in the characters’ situations, I loved the dialogue. In fact, at the time, I was both writing and acting, and a friend and I used to memorize monologues from the show because we thought they were excellent audition monologues. From childhood: Anything with a family who had unusual animals, like Gentle Ben, Lassie, Flipper, and Daktari. I used to long for a family who was cool enough to have a pet bear, dolphin or lion. Heck, I’d even settle for a dog who could understand people, like Lassie. Sadly, the Army frowned on having a pet lion living in base housing, or so my father told me. From high school: Happy Days and Laverne & Shirley. These shows could make everyone in the family laugh. All-time favorite: The Bugs Bunny Show taught me most of what I know about the classics: music, literature, great films, and classic movie stars. It was funny as a child, and got funnier as I grew up and got more of the “adult” humor. As a writer, I aim for this kind of humor–something to make kids laugh, and a little something to make the adults reading to them laugh, too. Oh man, this is a harder question to answer than I thought it would be. I didn’t realize how many TV shows had been an influential part of my life until I tried to narrow them down to “favorite of all time.” But two are without a doubt at the top: The Muppet Show and Gilmore Girls. 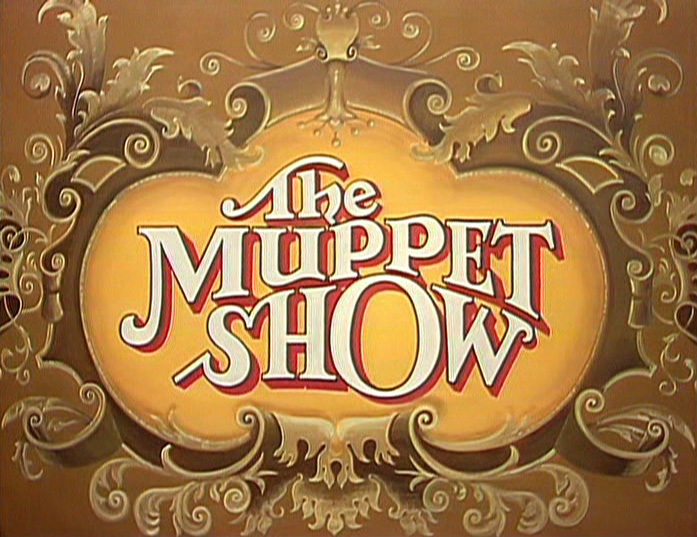 I have so much fond nostalgia for watching The Muppet Show every Sunday night with my parents and older brother. It sparked my lifelong admiration for Jim Henson. The Muppets gave the show the pretense of being for kids, but the humor and celebrity guests spanned all ages, and as a kid I loved that my parents and brother genuinely enjoyed the show as much as I did. I discovered Gilmore Girls on my honeymoon, oddly enough. 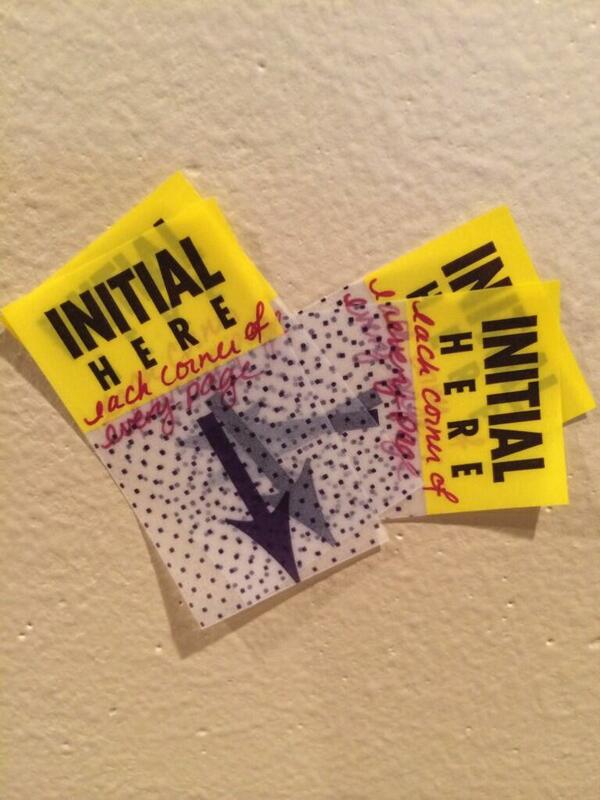 I came to the show late–I’d heard people gush over it but never took the time to watch it. But as soon as I caught part of an episode and heard the witty banter, saw the wonderful chemistry between the actors, and realized how smart and full of heart the show was, I was hooked. It’s become my #1 comfort show. Forget chicken soup–if I’m sick or feeling blue, you’ll find me on the couch visiting my old friends Lorelai and Rory. I didn’t think I watched much television until this question came up. I mentioned previously that Bionic Woman was my go-to TV choice as a child. 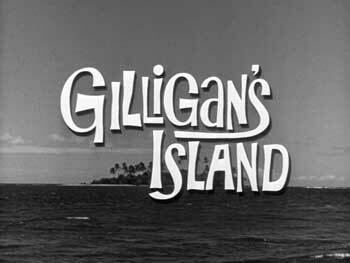 So was Gilligan’s Island. These days I’m a big fan of BBC shows. I adore period dramas like Downtown Abbey, Mr. Selfridge, and The Paradise. I suppose it’s not surprising since I love to read and write historical fiction and nonfiction. I love the visual details and historic portrayals. As for laughs, I’m a fan of Big Bang Theory. And, in the reality-show department, I prefer to geek out on ancestry shows like Who Do You Think You Are and Finding Your Roots. Once a research junkie, always a research junkie. Man, this is a big question. I really, really like good TV, so I’m just going to go with the first things that come into my head. Childhood – The Price Is Right. I think Bob Barker should probably get retroactively paid for babysitting me for like four summers in a row. 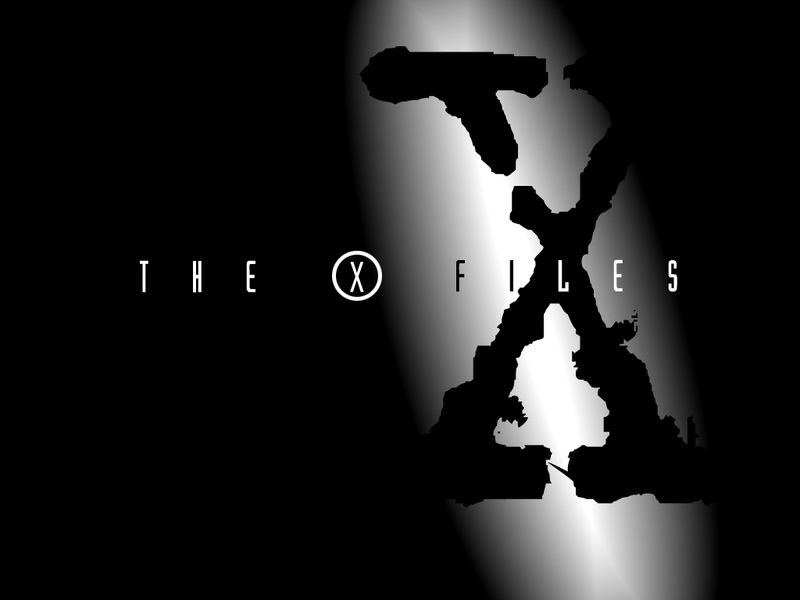 First big TV obsession: The X-Files. Mulder and Scully. I was hooked on the unresolved tension between them, and I would go to great lengths to justify any and all plot holes to myself in order to keep on enjoying it. Finally, recently, I’ve loved Arrested Development. I can’t think of any other show with more jokes per square inch. Amazing writing. Pure concentrated irreverence. I stand in awe. My all-time favorite TV show is Firefly, because what could be better than a western… in space? Oh, yeah, Nathan Fillion as a space cowboy. Everything about the show itself was perfect, from the opening theme music to the characters and their relationships to the futuristic interpretations to the moral quandaries. The only disappointment was that it was cancelled way too soon. I’ve had a kind of odd relationship with TV since I was born during the period of time where my parents had decided to throw the TV out of the house. My grandmother lived next door and she would sometimes invite my sisters and I over to watch The Lawrence Welk Show with her. I remember sitting there thinking, “This is the weirdest thing I’ve ever seen.” But my grandma was so sweet and enthusiastic and my grandpa was so generous with his Brach’s Pick-a-mix during the show that we’d settle right into that big flowered couch between them and happily watch the weirdness. Some years, my parents would import a television during the Olympics and we would lie on the floor of the family room for two weeks, wide-eyed, watching. I still have a strange, binge-watching relationship with the Olympics. But if you ask me about my favorite shows, I’d have to admit that they were shows that I didn’t really watch but, rather, listened to. When my kids were young, they would watch cartoons while I was in the next room getting dinner ready. So I’d only hear the voice track. My favorite TV show to “watch” in that way was probably Recess. My kids can still walk by and say something in a Spinelli voice and I’m right back there. My favorite TV show when I was a kid was I Love Lucy. No, I’m not quite old enough to have seen the show when it first aired, but there were marathon showings of it every year, and my parents would tape them (I am old enough to have grown up on VHS). Lucy showcased farce and slapstick comedy at its finest, and I like to think that a little bit of the comic timing rubbed off on me as I became a writer. I still love to write funny scenes that are slightly over the top–though thankfully, Gladys Gatsby’s kitchen disasters have not yet reached the epic level of Lucy’s! So…what’s your favorite TV show of all time? 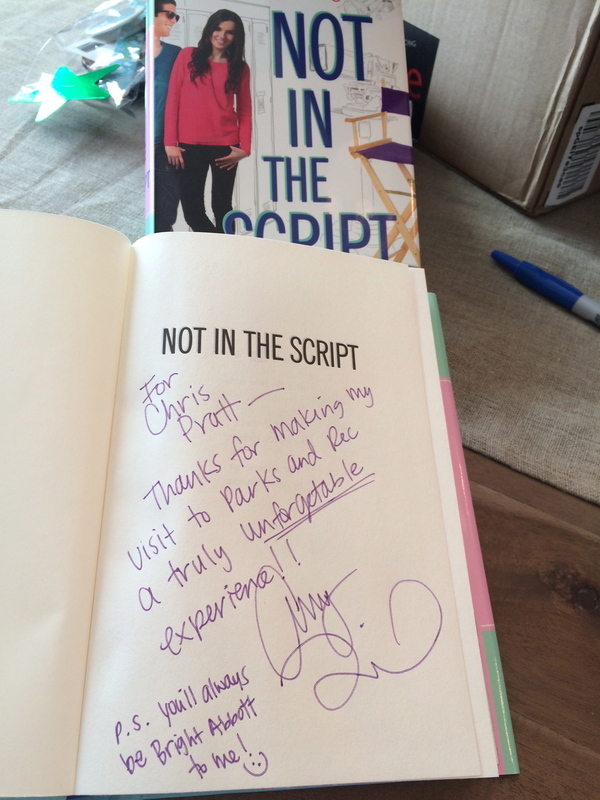 Tell us in the comments for a chance to win a signed copy of NOT IN THE SCRIPT, plus bonus swag! And don’t forget to add it to Goodreads here! I’ve read Amy’s book and I loved it! One reason I loved it is because I found Emma Taylor and Jake Elliott realistic and appealing as a couple. And isn’t “realistic and appealing” what makes a couple special? Especially a TV couple that we’re going to watch week after week! Isn’t “realistic and appealing” what keeps us watching? What TV couples keep or kept you watching a series? That is the question for the EMUs today. And that is the question for you! After you read about the couples that keep/kept EMUs watching, we would like for you to join us by voting in a poll. There are way too many “favorite” couples to list so I’m keeping the poll limited to the ones that the EMUs chose. If none of them suit your fancy, mention a couple when you comment. And don’t forget to comment because if you comment on any post this week, you will have a chance to win a copy of NOT IN THE SCRIPT along with some awesome swag! I gotta go with Bones & Booth…aka Dr. Temperance Brennan and Seeley Booth of BONES. I love the Sherlockian, literal mind of Brennan in contrast to the instinctual and emotional Booth. I love that they are playing against gender and the angsty period of ‘should we be a couple?’ didn’t go on and on. Speaking of Sherlock, I love the new BBC version with Benedict Cumberbatch and Martin Freeman. But that’s not really television, is it? I adore Leslie Knope and Ben Wyatt from Parks and Recreation. I love that they really love each other – they’re into each other, they’re geeks together, they laugh at each other’s jokes, and they admire each other. Each of them has put the other ahead of their own career, too. But my favorite thing about their relationship is that it’s never cynical. Their love is never threatened by the usual plot twists that threaten TV relationships. Leslie and Ben are just too solid for that kind of drama. 1) Penny and Leonard from “The Big Bang Theory.” A great case for opposites not only attracting but strengthening each other. I like to think that my husband and I do this for each other. Usually. When we’re not baffled by how the other one thinks. 2) Paul and Jaime Buchman from “Mad About You.” I swear NBC owes us some BIG money for bugging our apartment early in our marriage. We had some of the same conversations, disagreements, and situations that they did. They were two very different personalities, but they stuck together because they were, you know, mad about each other. 3) Cliff and Clair Huxtable from “The Cosby Show.” They were hilariously funny, but not at the expense of the other person. They had a great sense of humor, but they always treated each other and their kids with respect. Favorite TV couples…oh, this is a tough one. I’m tempted to go with Ross & Rachel from “Friends”–THE couple of my teenage TV-watching years–or Starbuck and Apollo from “Battlestar Galactica,” who had pretty much the best tension (though maybe the least functional relationship!) in all of space and time. But if I just have to choose one, I think I have to pick Cam and Mitchell from “Modern Family.” They provide plenty of hilarity, shrieking, and hysterics…but also know how to pull together when they need to for the good of their family. And for me, comedy + closeness seems like the perfect formula for a great TV couple. I loved rooting for Jim and Pam from The Office to get together. They were both just so nice! Pam gained confidence with every season and really figured out who she was and what she wanted out of life. Jim had such a good heart and a wicked sense of humor–he reminded me of my own sweetie in many ways. I felt every twist and turn in their relationship keenly, because they felt like real people to me. My favorite TV couple is actually a movie couple—Carl and Ellie from Pixar’s Up. It’s a great opposites attract kind of romance where the whole is so much greater than either of the parts would have been alone. Plus, I have a deep affection for couples who figure out how to make love work in the long game. The story of that romance only takes up five or ten minutes of that movie but the rest of the movie would be nothing without it. It’s about to be very obvious that I don’t watch much television and I am woefully ill-prepared to conjure pop-culture characters. Maybe because, in my house, the cat and I are the only females. And Mittens limits her screen time to cat videos on YouTube. I do catch Big Bang Theory sometimes and I kinda giggle at the pairing of Sheldon and Amy because they are both socially awkward in hilarious ways. But my first thought about TV couples was a blast to my childhood. I loved watching The Six Million Dollar Man and the Bionic Woman. Mostly, they were separate shows, of course, but I remember looking forward to any episodes when they crossed into each other’s television world. Steve What’s-his-name (aka Lee Majors) was a major hunk who could bend cities in half while he eyeballed straight through Mt. Everest. And Jamie What’s-her-name (Lindsey Wagner) was beautiful, strong, sweet, and she could hear a seahorse burp on the moon. Or so it seemed. Imagine the genetic lottery their children would inherit! Oh, oh, what if the children of the bionic couple (let’s pretend their bionicness was genetic) married Sheldon and Amy and had their own TV show. Ha! Now THAT would be a show I’d watch. 1) Luke and Lorelai from “Gilmore Girls.” I mean, he built her an ice skating rink, for Pete’s sake!! 2) Cliff and Claire Huxtable from “The Cosby Show”. The affection they showed each other felt so genuine, and they made each other laugh even when they were exasperated with one another. Maybe especially when they were exasperated with one another. 3) Coach and Tami Taylor from “Friday Night Lights.” The Taylors had such respect for each other, through all their ups and downs. Both were good people, and they worked so well together as a team. I know Chris already picked them, but I didn’t know that when I chose them. So, I’m going with Jim and Pam from “The Office”, too. (Chris, we should hang out and watch TV!) The reason they’re my favorite couple is that it was so sweet that Jim hung in there even though Pam was engaged to another guy And we all knew Jim and Pam belonged together way before they got together. Also, I loved the office-romance aspect and how they handled it. For me, they added a bit of “normal” in the most dysfunctional office EVER! They did it with a sense of humor and, to me, that’s a necessary element for “couple success” on or off the screen.Thanks for hanging around. And just for fun, vote for your favorite couple! Comment for a chance to win this super swagalicious giveaway. Comment on any of the posts this week (Oct. 6-10). 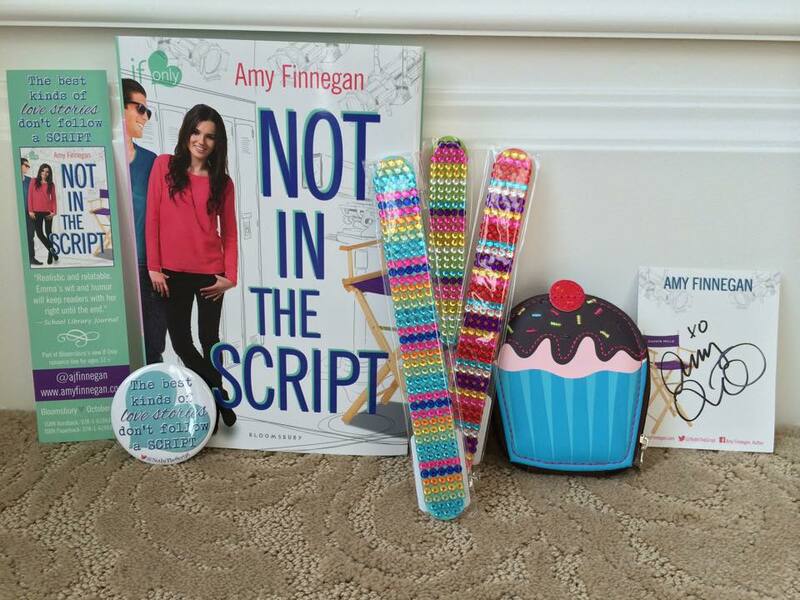 It’s the NOT IN THE SCRIPT launch party kickoff and giveaway! You may think we Emus have been doing an awful lot of partying lately, but we’re not done yet. 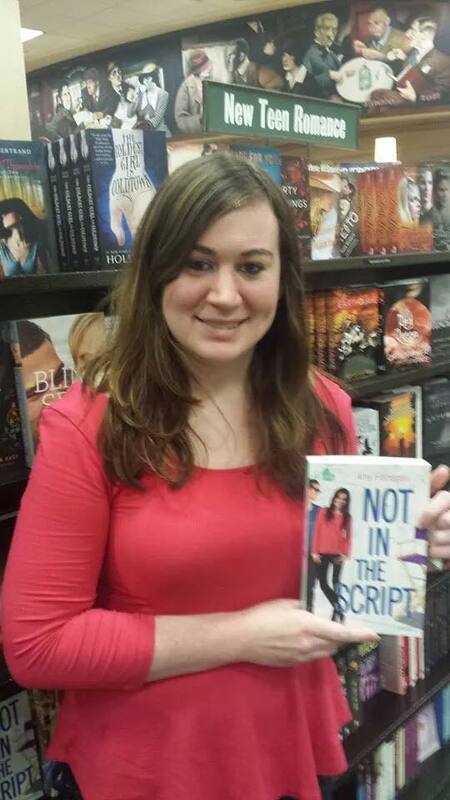 This coming Tuesday is the official release date of Amy Finnegan’s wonderful debut, NOT IN THE SCRIPT! So, toot your horns and throw that confetti, because we’ve got more celebrating to do, and we hope you’ll join us! The best kinds of love stories don’t follow a script. Millions of people witnessed Emma Taylor’s first kiss—a kiss that needed twelve takes and four camera angles to get right. After spending nearly all of her teen years performing on cue, Emma wonders if any part of her life is real anymore . . . particularly her relationships. Jake Elliott’s face is on magazine ads around the world, but his lucrative modeling deals were a poor substitute for what he had to leave behind. Now acting is offering Jake everything he wants: close proximity to home; an opportunity to finally start school; and plenty of time with the smart and irresistible Emma Taylor . . . if she would just give him a chance. When Jake takes Emma behind the scenes of his real life, she begins to see how genuine he is, but on-set relationships always end badly. Don’t they? Toss in Hollywood’s most notorious heartthrob and a resident diva who may or may not be as evil as she seems, and the production of Coyote Hills heats up in unexpected—and romantic—ways. One of my favorite things about the book is how it immerses you in the lives of the young actors, both on set and off. How was Amy able to bring the entertainment world to life so vividly? She’s heard years of behind-the-scenes stories from her industry veteran brother, plus she’s been lucky enough to visit dozens of film sets and sit in on major productions such as Parks and Recreation and Parenthood, so you can be pretty sure the fictional experiences are authentic. Want to know more? You can follow Amy on Twitter: @ajfinnegan, Instagram: StrangerThanFictionWriter, Facebook: Amy Finnegan, Author, or visit her at AmyFinnegan.com. For a chance to win this super swagalicious giveaway, just comment on any of the launch party posts today through Friday. We’ve got all kinds of fun things planned to celebrate, so be sure to check in every day this week! Whether or not we are the mean-spirited type, we judge other people. We judge music. We judge food. We judge books. We either deem them worthy of our praise, or deserving of our scorn. Sometimes we just give our targets a “meh” and move on. This topic has been discussed a few times here on EMU’s Debuts lately, which has led me to think more and more about it, especially as the launch of my first novel approaches. But a recent experience helped me view the compulsion to not only notice, but share what one considers a shortcoming, from a different angle . . . one that doesn’t involve the book that I spent several years writing. It involves my new home instead. Then a hole was dug. A foundation was poured. Walls were built. I began to see my paper dream house become an actual home. It was beautiful (OMG! Look at what I’ve done!) and also scary (OMG! What have I done?). It was an exciting, exhausting, stressful (!!!!) twelve months of building. I was there nearly every day for several hours, micro-managing every detail so it was truly built exactly the way I wanted it to be. And FINALLY, it was finished, and it was decorated with everything that my family loved. It was perfect for us. We practically skipped through the halls. 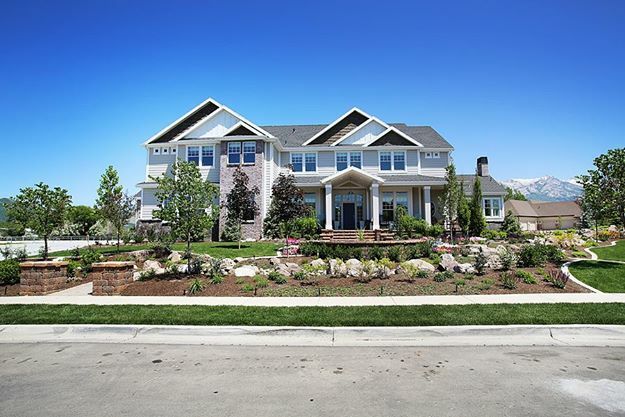 And then, my friends, we opened it up—as we had promised our builder and subcontractors that we would do—to the Parade of Homes, wherein close to 20,000 people walked through every room with little blue booties over their shoes. Let . . . the . . . criticism . . . begin. 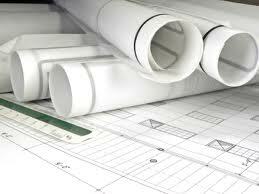 Reviewer 1: How many different materials can be crammed into a room? Busy, busy, busy. Less is more, more is unappealing. Reviewer 2: I have never seen a house done so beautifully! Make sure you have enough time to really take in every inch of it . . . every detail is spot on. 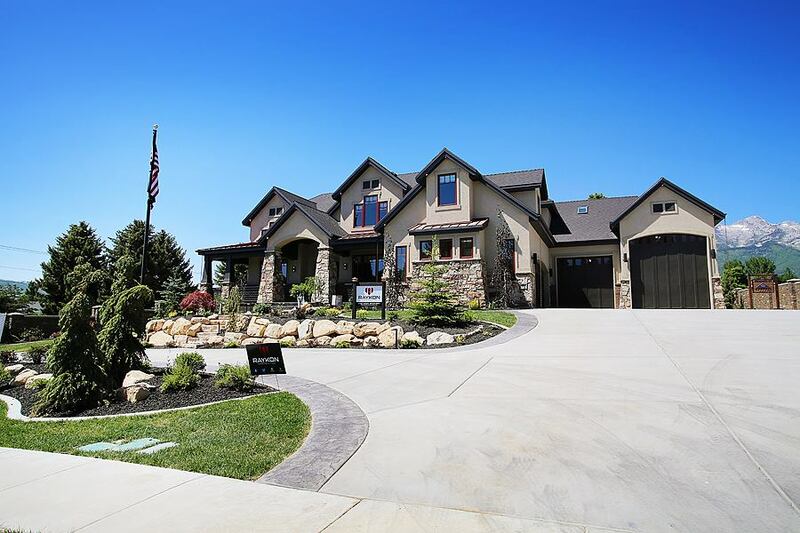 Reviewer 1: This house is one of a kind, hands down the best house I have ever been in! Aaaaaammmmmaaaaazzziiiiiinnnnngggg. Reviewer 2: I was underwhelmed . . . disappointed on all levels. Reviewer 1: The theater was so bad with sheared fabric on the walls — really!?!?! Reviewer 2: One of the nicest home theaters I’ve ever seen! Reviewer 1: Oh. My. Gosh. What more is there to say!?!?! Can I give it 10 stars?!?! Reviewer 2: Gross . . . . Seriously gross. But people have their own likes and dislikes, for reasons that even they can’t always explain. To argue with them is pointless. As an author, it’s absolutely, positively, IMPOSSIBLE to write a book that every reader will like. It will never happen in the history of the world. I personally feel that Harry Potter is the best book series that has ever been written. It melts my soul with its goodness. I’ve read it over and over and over again, and I laugh and cry in all the same places (and additional ones as well). But online, that series has tens of thousands of one-star reviews. Some people hate it with a passion beyond reason, as though it was written by the devil himself (or in this case, herself). How can our feelings toward the very same books be such polar opposites? But isn’t that the case with almost anything? Books, music, movies, art, food . . . homes? Everything is subjective, and its value always depends on the eye of the beholder. It wouldn’t have been appropriate for me to approach her and explain why we didn’t get a pool table, but an unexpected thing happened at that moment. I laughed out loud. Totally laughed. Like, all day long. Because it reminded me of the way book reviewers sometimes trash an entire book because the story doesn’t end how they think it should’ve ended. Would this lady have otherwise been super pleased with my basement if we’d had that one missing element? I doubt it. We already have a LOT of cool stuff down there. 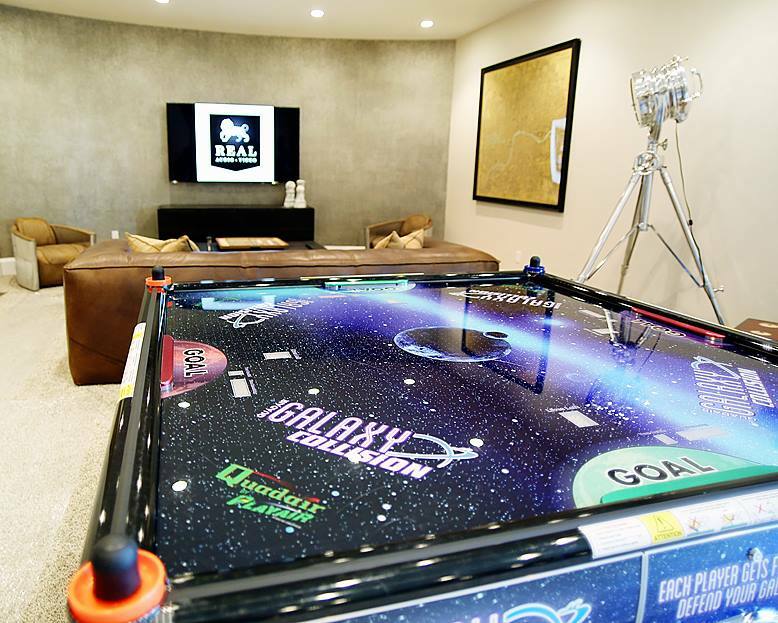 Among other features: an indoor sports court, a Harry Potter themed theater with signed props and memorabilia from the movies, an arcade, a Beatles themed music room, a ping pong table, and a four-person air hockey table. Not even this was enough to earn her approval. The space in question: a pool table we would rarely use, or a 4-person, tournament-style air hockey table? So why, dear questioning Parade Lady, do we NOT have a pool table? Because we didn’t freaking want one, okay? Would YOU want a $15,000 pool table if you had two teenagers and one eight year old who constantly had dozens of friends running through your basement? Would YOU want a pool table if you knew pizza and pop and caramel corn would end up on it no matter how diligently you tried to avoid it? Would YOU want a pool table if no one in your family even played pool? Or would you get one anyway just to impress people who thought you SHOULD have one? These are the snarky types of replies authors often want to give to critics of their work. And it will definitely be difficult for me to resist doing so. There will probably even be times when a review makes me cry and I will wish I’d never even written the book. It’s going to be tough. I’ll have to develop some thick skin. Most authors I know refuse to read their reviews. They cause too much doubt, I’m told. They mess with your writing mojo. They make you feel horrible about yourself. That’s very sad. So to all you writers out there pouring your hearts out and giving the world a glimpse of your very soul, THANK YOU FOR SHARING! I don’t care if you don’t have a pool table in your book, or in your basement, or anywhere at all! I love that your stories are exactly how they feel right to YOU! Amy Finnegan writes her own stories because she enjoys falling in love over and over again, and thinks everyone deserves a happy ending. She likes to travel the world—usually to locations where her favorite books take place—and owes her unquenchable thirst for reading to Jane Austen and J.K. Rowling. Her debut novel, NOT IN THE SCRIPT, came about after hearing several years of behind-the-scenes stories from her industry veteran brother. She’s also been lucky enough to visit dozens of film sets and sit in on major productions such as Parks and Recreation and Parenthood. You can follow Amy on Twitter @ajfinnegan, or Facebook (Amy Finnegan, Author). 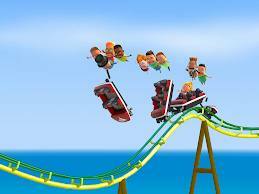 Imagine yourself on a roller coaster—not some wimpy one with a few repetitive twists and turns, but an unpredictable, double-looped, eighty-mile-an-hour roller coaster. Having fun yet? Great! Now . . . remove all safety devices. Lap belt, gone. Shoulder bars, gone. In fact, you don’t even have handles to hold on to. I don’t know about you, but I wouldn’t like that ride. I’m convinced that this is what my publishing experience would feel like without my agent. She keeps my head, arms, hands, feet, and legs inside the vehicle at all times. She does all she can to make the ride an enjoyable one. Sure, I might scream my lungs out sometimes and think I’ll never make it off this crazy ride alive, but in the end, I’ll jump out of the cart and race back to the end of the line to do it all over again. But only because I feel like my agent will keep me from serious harm. Yep, I’m a play it safe sort of girl. I love the thrill of a fast, bumpy ride, but I want to know that in the end, it will be all right. Having an agent is about even more than that though. Through a series of fortunate and unusual events, I was able to get an offer for my debut novel without an agent. But I took the advice of several wise friends who told me I should try to acquire one anyway, and thank heaven I listened! My agent not only negotiated better terms for my contract, but she was also able to explain what the contract terms even meant. I would’ve had no idea what I was signing without her. Boilerplate contracts don’t have to be predatory—though some of them are, so author beware—to make you regret the terms later. A good agent protects you from agreeing to unreasonable clauses. He or she will also work to make sure your terms are the very best they can be. And even after my contract was agreed upon via email and phone calls, my agent went back through it word by word to ensure that everything that had been discussed was carried through. I could barely comprehend what the papers were saying to begin with, so I certainly wouldn’t have known if the contract had been amended correctly or not. I would’ve just signed it (because, OMG! I have a contract from a major publisher in my hands!!!). Once the editing process began, I loved having my agent copied on the emails. I’ve been lucky because my editor shared my same vision for the novel, but I know—for sure—that my agent would have had my back if I had needed to fight for something in my novel that my editor and I strongly disagreed over. And if the novel would’ve been better my editor’s way, my agent would’ve been a second voice to guide me in my editor’s direction. And it would’ve been a lot easier for me to make a significant change. 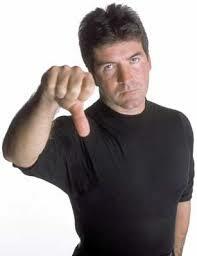 Also, just weeks after turning in my revision based on editorial notes, my editor left for another house. I was heartbroken. I was afraid of being “orphaned.” But both my agent and my new editor made it an easy transition, preventing my novel from slipping through the cracks. I’ve been very well taken care of. Had I not been . . . guess who would’ve made the important phone call to The Boss? Not me, that’s for sure, because I have a difficult time going after what I want. But my agent would’ve been all over that like ants on a watermelon. It’s also a comfort to know that my agent is copied on all of my emails involving the sales and marketing side of publishing. For example, she watched over and participated in the creation of my cover and jacket copy. There was a lot of back and forth about both of these important steps, and she was there for all of it. She’s also told me when it was time to ease off and trust my editor and publisher with particular tasks. She’s told me when I should feel comfortable asking for a bit more support. I trust her implicitly. She also trusts me. She lets me make the final decisions. She recognizes that this is my career, and my dream, and my name going on the cover of my books. She’s my biggest cheerleader and champion. Another thing I love is that she doesn’t push me to just “pump out books.” She recognizes that there are other important facets in my life that I often need to pay more attention to (my three kids, in particular). I’m also not the most productive author in the world because I’m an incredibly cautious writer. I need a story to truly feel right to me before I share it with anyone else. That’s just how I work. But my agent doesn’t see me as just another cash cow on her bestseller-producing ranch, and that allows me to give the best of myself, not just the most of myself (which hopefully won’t end up in the dairy section). I know this sounds like the most shameless commercial ever for my agent Erin Murphy, because she really is the best agent on this entire planet, but last I heard, she isn’t taking on new clients for a while. My actual purpose for writing this is to give those of you who are questioning whether or not you should pursue an agent, a very strong nudge in that direction (check out the fabulous agents at EMLA first! All three of them are the best possible agents any writer could dream up. Now that’s a shameless commercial). I used to think that having an agent was all about negotiating a deal—which just about any agent can manage—but I now understand that it’s much more about having someone by my side during the entire publishing process. My best tip for seeking out an awesome agent of your own is to research them like crazy. Get to know their personalities through social media, check out the types of books they represent—do you like them too? And above all things, listen to how other authors talk about their agents. (By far the most common thing I hear published authors complain about is their agent’s lack of enthusiasm or interest in them. Emails aren’t answered, concerns aren’t addressed, and personalities clash.) Pay close attention when authors are raving about their agents in more private situations. Get the name of their agent and begin your research! There are a lot of great agents out there, and one of them surely has YOU on their wish list. Get to know them, and then submit when you feel you’ve found a good fit. 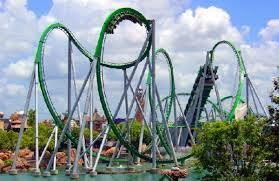 Then hold on tight and enjoy the ride! Friends!! It’s here!! My cover!! And this isn’t just a cover reveal. Oh no. Read to the very end of this post and I’ll give you a link to where you could win an advanced copy of the novel that goes with it. NOT IN THE SCRIPT won’t officially be on shelves until October, but if you win this giveaway, you’ll get to read it within the next few weeks. Some of you are probably wondering why an author would get this excited about revealing the cover of her upcoming novel to the entire world (or at least to the U.S., my family and friends in the UK, my three friends in Canada, the two bloggers I love in the Philippines and Australia, and my buddy Matt in Hong Kong), but THIS IS A PRETTY BIG DEAL FOR ME! I started writing with the hope of getting published twelve years ago. NOT IN THE SCRIPT is the fifth novel-length manuscript I started—the fourth that I finished. But it’s the only novel I’ve ever felt brave enough to submit to publishers. That “one day” is today. I finally have a fancy cover and it has my name on it. Here it is! Click on the cover to make it bigger! Yay! I hope you love it as much as I do. But even more so, I hope you’ll love what happens after you turn that cover over and start reading the pages. So here is my very first ARC (advanced reading copy) giveaway, and it’s sponsored by one of my favorite book review blogs, IceyBooks.com. Instructions on how to enter the giveaway will be there! Another one of my favorite blogs is PopGoesTheReader.com (the reviews are fantastic! ), and the host is revealing her own thoughts about my cover today. This is way too much excitement for just one girl to handle, so thank you for sharing it with me! And a very big shout out to the fantastic art department at Bloomsbury! You guys rock!! 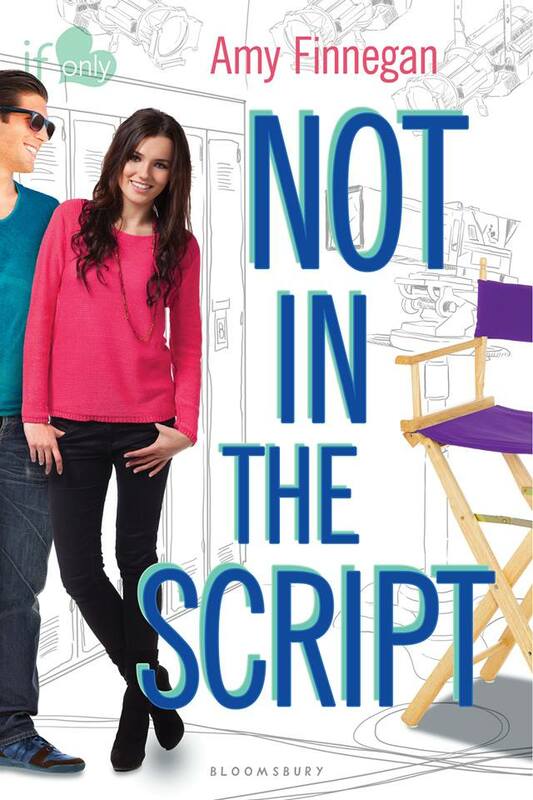 Want to know more about NOT IN THE SCRIPT? Read this: Millions of people witnessed Emma Taylor’s first kiss—a kiss that needed twelve takes and four camera angles to get right. After spending nearly all of her teen years performing on cue, Emma can’t help but wonder if any part of her life is real anymore . . . particularly her relationships. But her new costar, Jake Elliott, couldn’t care less about how many scenes he has to fake his way through; he needs the money. Toss in a reckless heartthrob, desperate for a comeback, and a resident diva who may or may not be as evil as she seems, and the production of Coyote Hills heats up in unexpected—and romantic—ways. Along with offering front row seats to the real life drama that often unfolds within the entertainment industry, NOT IN THE SCRIPT is a story about two not-so-typical teens who are searching for themselves, and just happen to find each other. You can add it to your Goodreads “Want to Read” shelf here. NOT IN THE SCRIPT will be released October 7th, and is now available for pre-order (with discounted prices!) from Barnes & Noble, Amazon, and Books-a-Million. As a writer of books for children, the most difficult thing for me to admit is that I wasn’t a big reader when I was a child (which is very a-typical for kidlit authors). I read and loved a lot of picture books during my elementary school years, and then some Amelia Bedelia early readers, but I can literally name—on just two hands—the novels I remember finishing before I graduated from high school. They were pretty much all by Judy Blume and Roald Dahl. I look back now and can’t figure out exactly why I wasn’t a big reader—my parents both read incessantly and took me to the library all the time—but I have a clue. Truth be known, reading was difficult for me. More often than not, I felt frustrated because I would read five or ten pages and then realize I had no idea what was going on. I couldn’t remember which character was which or how they knew one another. I didn’t feel attached to the story at all. As it turns out, I had a learning disability that I didn’t know about until I was in college. But I won’t put a label on it now because this isn’t the point of my post. The point of my post is to say this: My writing ability has taken a very long time to develop because I wasn’t a big reader until I was in my twenties. And now I’ve been playing catch up for the next twenty years. I started with non-fiction (typical for a college student), moved on to the adult market, then finally—for the first time in my life—truly discovered the magic of middle grade and young adult novels. And that’s when I fell in love with reading. It became an addiction. I wholeheartedly agree. Reading is, by far, the best thing a writer can do to sharpen his or her storytelling skills. Yes, you also need to write and write and write, for development, but very little improvement will take place if a writer isn’t learning from others through a process similar to osmosis. Exposure to excellent storytelling, and lots of it, can’t help but rub off. As a reader, the more books you read, the pickier you become about loving a book verses just liking it. Or even finishing it. Right? But when I see the masters at work, I learn. And I absorb. And this is another critical element: A writer needs to know and understand the genre and market they’re writing for. If you’ve been involved with critique groups and read enough pages from beginning writers (and believe me, I was one of them, so I’m not knocking anyone), it’s likely that you’ve heard sample pages that don’t fit the parameters of the author’s intended market. Perhaps it’s a picture book with 3000 words. Or the story is about seniors in high school, who should be thinking about college applications and their unattainable crush, but is instead filled with pranks on teachers and middle grade gross-out humor. Knowing what works in each market, and what doesn’t, is obviously paramount to your success. And you’ll only know this if you’re intimately familiar with your chosen genre. And then there is pacing. This is another thing I struggle with. I think of a cool scene that I’m dying to get to, or that awesome moment when my two main characters finally get things right, and I want to make it happen that very moment. I want the plot to move over so my characters can make out express everything they’ve been holding back. But the best pacing uses restraint for a slow burn; it builds up for a worth-while reveal. It makes a reader work for the rewards. And it also knows when to push all the details about the carpet and drapery out of the way and get on with the story. I love that about reading, because good pacing is something that can only be understood through experiencing it. It can’t really be taught, and it’s certainly difficult to master. Another benefit of continuous reading is recognizing clichés or overdone plots. While it’s true that there are “no new ideas, only new voices” editors likely won’t even read your first page these days—no matter how stellar your writing is—if your pitch tells them that the new girl in school is unavoidably attracted to a mysterious boy who is actually—gasp!—a vampire/werewolf/dark angel. While this pitch in various forms sold book after book about seven years ago, writers who keep up with the ever-changing trends will likely know better than to spend their time on a similar plot (but check back in another seven years). And the #1 reason to read: isn’t reading THE BEST THING EVER, anyway? I’m still not a fast reader, and my struggles with attention haven’t entirely faded, but once I get hooked on a good book, I’m gone. I’m in heaven. And I want nothing more than to help my own readers experience this same emotion. So tell me, what has reading done for your own writing? Has it helped you avoid overdone plots or character types? Honed your skills? 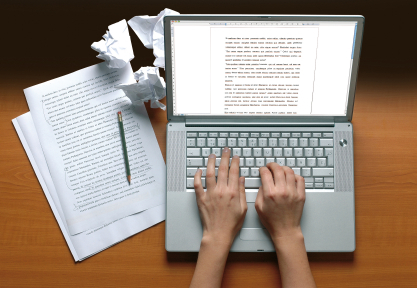 Does good writing put you in the mood to work? It surely does that for me! Amy Finnegan writes Young Adult novels and is a host at BookshopTalk.com. Her debut novel, NOT IN THE SCRIPT, will be published by Bloomsbury, Fall 2014. You can follow Amy on Twitter @ajfinnegan, and Facebook (Amy Finnegan, Author). 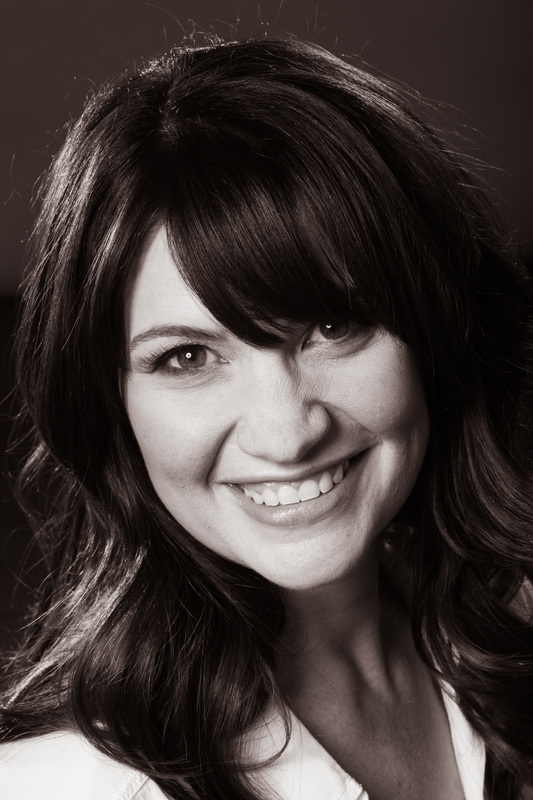 She is represented by Erin Murphy. Years before I was even offered a contract, new writers started asking me if I would tell them how to get published. Some have asked if I would connect them to an agent or an editor. Others have wanted to know how to write a surefire query letter. These are the same questions I asked established writers when I was new, and every question is a good one. Every one of them is important if a writer wants to eventually work with a respected, traditional publisher. But—trust me—if I knew a quick-and-easy secret formula, I would’ve used it a long time ago. You don’t need to attend conferences and workshops, but I’m telling you, I would’ve never been published if I hadn’t made the investment in a good education. And I’m not talking about my college English classes. Writing and selling a manuscript is tough stuff. The good news is that many brilliant authors have done it before you, and especially in the Children’s/Young Adult market, they are more than willing to share their knowledge and experience. At conferences, you get the opportunity to learn from their presentations, ask them questions, and even benefit from their critiques of your work. Editors and agents are often in attendance as well. Not only does this give you an opportunity to get a feel for what type of manuscripts they’re looking for, but in most cases, you’re then given the okay to submit to them directly. And this is a big deal. Every major publishing house I know of is closed to open submissions, meaning that you need a reputable agent to submit the manuscript on your behalf. And more and more agencies are closing their doors to open submissions, too . . . which means you need to have an “in” with them as well. So how do you get that “in?” By attending a conference where that agent or editor is presenting. As far as conference costs are concerned, it’s important to do some serious research. There are workshops aplenty—many of them very beneficial—that are less than $100. And there are also several that are over $1000. Some are even $2500 and beyond. Personally, I’ve never seen a workshop in this later category that looks worth the price (in fact, I think the majority of these highly-priced workshops are predatory). So definitely look into the details, find some conferences or workshops that meet your needs, and decide if the price seems reasonable. For the Children’s market, you’ll find an excellent array of upcoming events at www.SCBWI.org. And my personal favorite week-long conference—for cost, improving craft, networking, and its impressive track record for connecting writers with their future agents or editors—is called Writing and Illustrating for Young Readers. You can find more info about it at www.wifyr.com (I’m not paid for recruiting, I swear! I’ve just attended it several times and love it). Form genuine relationships with people who can both formally and informally mentor you. Learn as much as you can about the business from them. BUT keep in mind that it generally makes an author uncomfortable when you ask them to hook you up with their agent/editor. If you are genuine friends with an author, then he or she has likely read some of your work, so if they feel it’s a good fit for their agent/editor, they will likely tell you. Otherwise, do your due diligence, just as they did, and query the editor or agent yourself. Where do you start if you want to get more involved in the community? Thanks to the internet, the world has become a very small place. Technically, there’s no need to even travel away from your laptop when it comes to making new friends, so get out there and make some. Start following writing blogs, Twitter feeds, and Facebook pages, especially those by successful authors. Then just . . . absorb. Listen in, and eventually jump into conversations. Let’s go back to conferences and workshops because they’re the best way I know to do some critical networking. Some people claim that it’s who you know in this business that can get you a book deal, and guess what? They’re often right. But it might not be what you’re thinking. It’s more like who you know, and what they can teach you. Or . . . who they know, and what they tell others about your manuscript. I landed my first major book deal last May, and it was the direct result of one Important Person in the industry—who had read my entire manuscript—telling another Important Person (during a typical morning commute in NYC) that she felt my manuscript might be a good fit for Bloomsbury. And it was. So very good things can come from simple networking, which often results in forming genuine friendships. Attending conferences, networking with other writers, and joining a critique group will also teach you a lot about craft. And nothing you do will be as important as writing a quality manuscript. For new writers, especially, it’s easy to get caught up in the logistics of selling a book (how to write a query letter, how to get connected with agents and editors, etc). But no matter how well you know the publishing business, it won’t mean a thing if you don’t know the craft of writing. And . . . no pressure . . . but you have to know it well enough to stand out in a sea of millions of others who want a contract just as much as you do. That’s the real Secret Formula, my friends. Now, stop reading this and get to work! You have a book to sell!